Jacaranda will be publishing a new edition of Jacaranda Economics and Business Alive 7 for the Australian Curriculum in 2017 for use in 2018. The updated title will be available on the new eBook powered by learnON, the immersive digital learning platform. Please visit the Jacaranda Australian Curriculum Economics and Business page for more information. Economics & Business Alive 7 Australian Curriculum Edition eBookPLUS (Online Purchase) is a comprehensive digital resource with completely new material created specifically for the Australian Curriculum. • Digital resources include video topic introductions, crosswords, multiple choice and true/false quizzes as well as eLessons and interactivities. 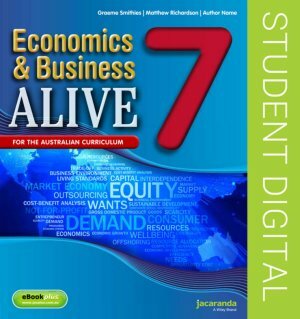 Economics & Business Alive 7 Australian Curriculum Edition eBookPLUS is a digital-only resource and provides access to all the course content. It also includes a wealth of multimedia resources accessed through our JacarandaPLUS website (http://www.jacplus.com.au/).